This is a profile of a character of mine: Sepp Rennis, done in greyscale because I still can't find the colored pencils I prefer to use. Also note, this is written for a sort of urban-fantasy setting not neccesarily set in our modern world. Religion: Atheist, but open-minded on others' faiths. Personality: Sepp is a friendly man, fairly physical in his sense of comereadery (SP??). He's also a prankster at times, owing to his heritage as a coyote. He is very much in love with his mate, Kato, and is on very good terms with Kato's sister Aria. 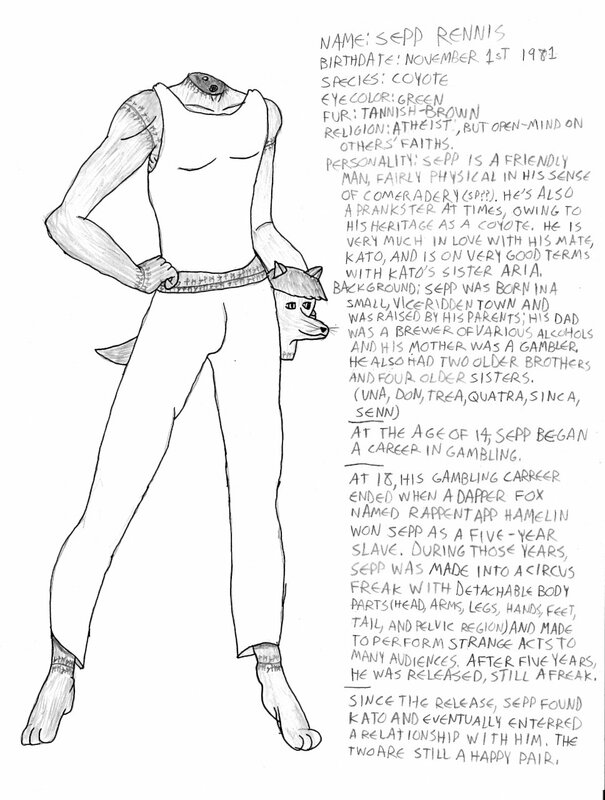 At 18, his gambling career ended when a dapper fox named Rappentapp Hamelin won Sepp as a five-year slave. During those years, Sepp was made into a circus freak with detachable body parts (head, arms, legs, hands, feet, tail, and penvic region) and made to perform strange acts to man audiences. After five years, he was released, still a freak. Since the release, Sepp found Kato and enterred a relationship with him. The two are still a happy pair. Modularity is not strange to the DC superhero Metamorpho. It's all due to his no longer being made of flesh,blood and bone. No internal organs ... can change into any element in the human body or combination of such, and in any form. Exploding into atoms (nitroglycerin...)is very hard on him. Still, he's looking for a cure, but I think it's impossible,and he may be resigned to being a chemical freak.